Welcome to ComingSoon.net’s April 2 Blu-ray, Digital HD and DVD column! As you can see, we’ve added a video player at the top highlighting this week’s releases, and you can find more detailed write-ups of different titles below! Click each highlighted title to purchase through Amazon! Cybertron has fallen. When Optimus Prime sends Bumblebee to defend Earth, his journey to become a hero begins. 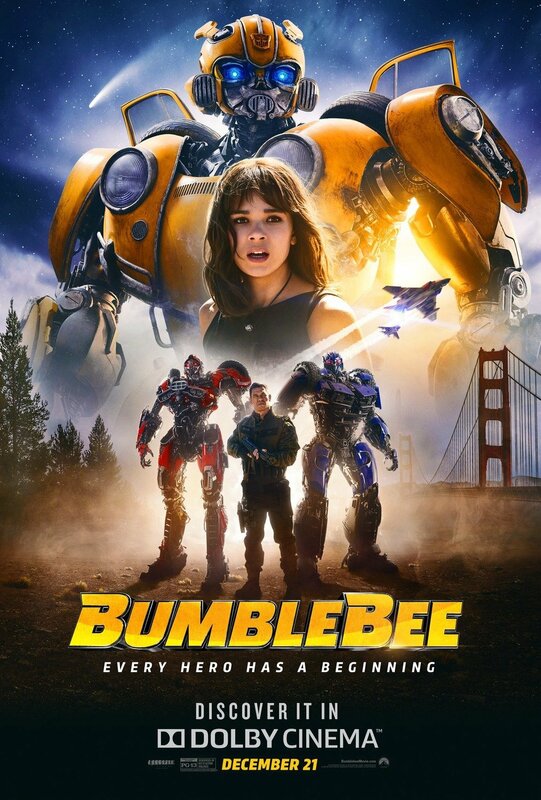 Charlie Watson (Hailee Steinfeld), a teenager trying to find her place in the world, discovers and repairs the battle-scarred robot, who’s disguised as a VW Beetle. An American war hero who secretly assassinated Adolf Hitler has now been called upon to take out another global threat – Bigfoot. When a grade school student with impaired hearing is bullied mercilessly, she transfers to another school. Years later, one of her former tormentors sets out to make amends. A coming-of-age drama that blasts open the world of grunge-era teenagers in the early 90s. Thomas Harrison is determined to start his own alternative band after the suicide of Kurt Cobain — it’s an obsession that blinds him to what’s either the mental collapse, or the eruption of musical genius, of his little sister, Bridget. Check out our exclusive clip below! This documentary reveals how both Hitler and Nazi Germany were heavily addicted to drugs. The recently unearthed journals of Hitler’s personal doctor, Théodore Morell, suggest that the Führer was a full-fledged addict, taking an assortment of drugs including cocaine, opiates, steroids. Meanwhile, the entire nation of Germany was binging on speed. Alice Howell was one of the great female clowns of the silent screen, and starred in her own very popular series of comedy shorts for different studios from 1915-1925. Her hilarious onscreen persona of a slightly addled working-class girl combined feminine delicacy with out-and-out slapstick rough-house. Alice Howell is relatively unknown today, as a majority of her films are lost. This 2-disc DVD set presents, for the first time, a comprehensive selection of Howell’s surviving comedies for fans of classic and silent film comedy to discover and enjoy. Celebrate 20 years of Mike Mingnola’s ground-breaking comic book with the double feature of Hellboy Animated- SWORD OF STORMS and BLOOD & IRON – from visionary Guillermo Del Toro. This limited edition comes with an exclusive mini comic that includes the full story of The Chapel of Moloch. A story of two brothers, both writers of crime novels, one a fine, upstanding gentleman and the other a moody, neurotic, psychopath. The other is determined to create a ‘faked’ version of a perfect crime he intends to commit when an ex-convict visits them. They are both in love with their shared-stenographer-secretary. Nick Cannon plays a fading movie star in need of a career revival and his writer friend, Evan (Rhys Wakefield) who never tasted success. Both believe their zombie script will provide the breakthrough they need, but they are in desperate need of inspiration to finish the project. His probation almost over, hotshot surgeon Hugh Knight (Rodger Corser) is finally free to head back to Sydney. But a family tragedy makes leaving his rural hometown harder than ever, as Hugh must choose between saving the Knights’ farm and furthering his own career. The final season of the drama tackles the contentious world of politics, with disbarred lawyer Cleaver Greene (Richard Roxburgh) having won an Australian Senate seat on a campaign promise to do nothing. Archer navigates the mysterious and deadly world of Danger Island as an alcoholic seaplane pilot in the all-new season of the FXX animated comedy.